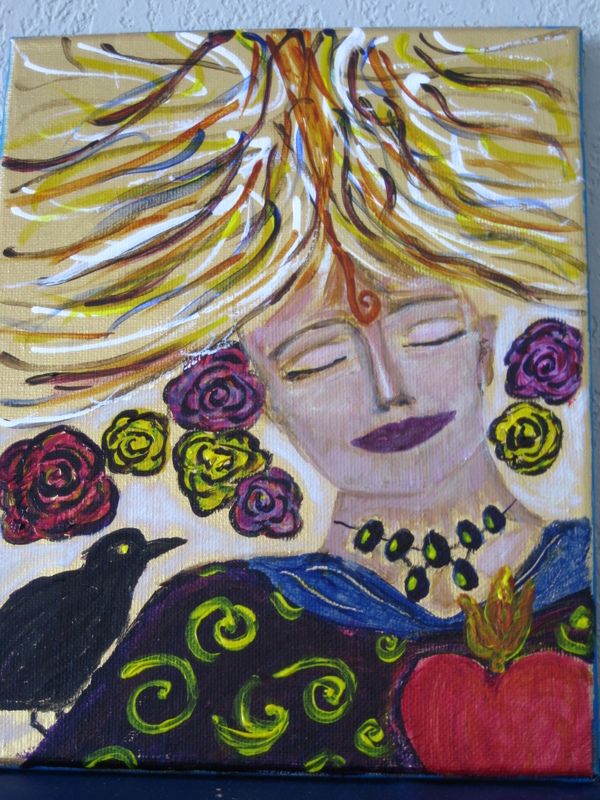 This painting has to do with my intention to more fully integrate my physical body with my soul/mind/spirit. 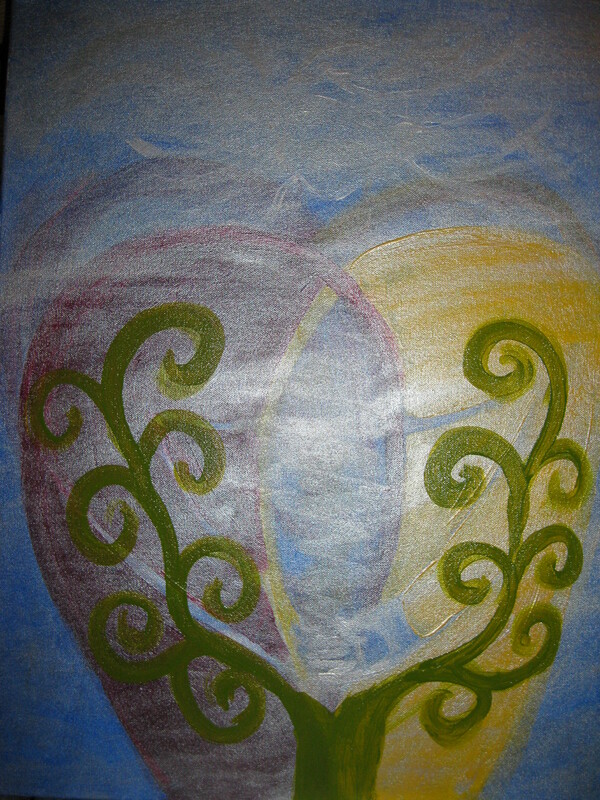 I was inspired by the idea of two interlocking circles, where the overlap is in the shape of a mandorla, or vesica piscis, a shape that has had many meanings over the centuries. It’s “where it’s at,” however you might define “it”. 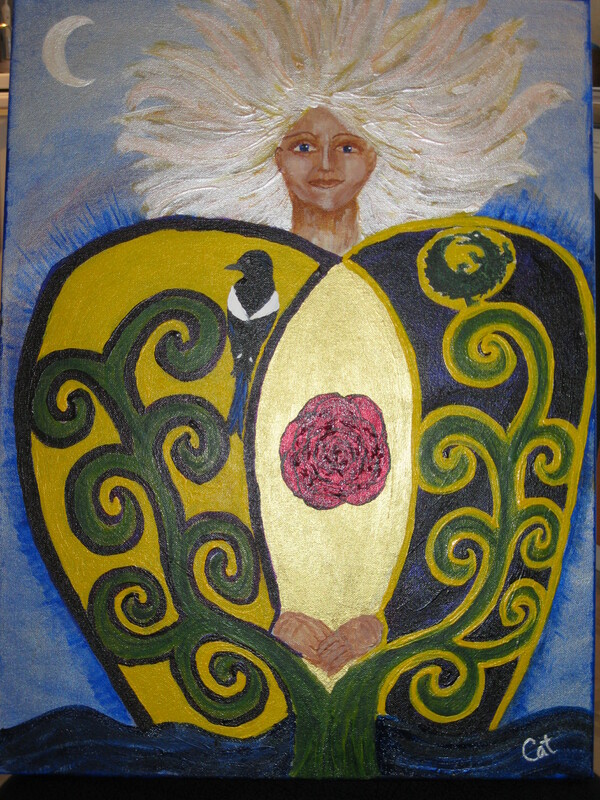 In my mandorla sits the rose, symbolic of the unfolding mystery of life, as it is living itself out within who I am. The swirling tree in both sides of me connotes growth, and the tree is rooted in the river, the river of life. The colors of both sides are represented in the other side, as each side actually started out the other color. There is no real separation within us. The heart shape, symbolizing love and acceptance, is repeated in both the body and in the shape of the hands. On my shoulders are a magpie and an alligator. Every time I go out of the house, and most any time I look out a window, I see first a magpie. For me, they remind me that there is more to life than the mundane, as they, with crows and ravens, have often signified the spiritual dimension. Magpies also remind me to use my voice. The alligator, an animal that has not shown up in my psyche before, came to me in a dream the night I set my intention for the painting. I dreamed of two boys each leading an alligator as one would lead a dog. One boy was very young, maybe 4-6 years old, and his alligator was young, in great health, and very magnificent. The other boy was maybe 10-12, but his alligator seemed very old, tired, lacklustre, and listless. The word “listless” seemed very, very important in the dream. At first I didn’t want to look at the second alligator, but when I finally did, I found that it looked as though it had survived a “great something.” It looked as though it had been through a lot, but was S.S., as Dr. Estes would say, “still standing.” I found myself really admiring that alligator. In the dream I realized that “listless” was a pun: that it really meant for me “list-less,” as in, “without a list.” Those of you who have known me for awhile know that I have lived by my many lists of things to do, things I might do, people to call, posts to write, etc. I sensed strongly that I need to be “list-less” for at least awhile. After playing with the dream for awhile, I realize that I am the older alligator, having been through some great somethings, yet still standing. And that my psyche was telling me to be “list-less” at least for awhile. The dream was profound, and as I looked up some symbolisms for alligator, I found that as reptiles, alligators rely on their environments to keep them healthy and energetic —- if it is too hot or too cold, reptiles cannot regulate their body temperature and are at risk. I, too, have become exquisitely sensitive to whatever environment I am in. Alligators are also, among reptiles, unusual mothers in that they help their young hatch from the eggs, then carry them in their mouths down to the water, and stay with them for several months. They are associated with the Great Mother. For the past 18 years, my primary identity and self-understanding has been as mother — perhaps, too, an unusual mother in many ways. I chose to represent the alligator in a pose reminiscent of the ouroboros, a snake biting its own tail, symbolic of many things, but primarily that of full circle completion: wholeness. It also symbolizes one who has incorporated its opposite, or shadow. Both meanings are ones I would like to incorporate into myself, and both grow out of my intention to more fully unite with my physicality. And the waning moon, so beautiful, refers to my life now where more years are behind me than in front of me. It is a beautiful time of life, as are all the times of our lives, as are all the phases of the moon. Part of the reason I’ve gone into this rather detailed explanation of the painting is that I wanted to give an example of how I work with symbolism, dreams, and intentions while painting. I find it especially interesting how dreams are often a commentary from the greater psyche on whatever it is that we’re occupied with on a conscious level. Do you work with your dreams in image or word? What kinds of symbolism do you find personally meaningful? How marvelous that there is something rather than nothing. All that is, moves, interpenetrates. Where is there to go, but right here? this conscious materiality within me, in front of me? My opening to this universe, this “one turning,” is my dear body. Dear body, though, is often literally a pain. My opening to all that is runs through a material tired, worn. My material: my matter, from Latin ‘mater’. Mother. It’s not that the soul is in the body. The body is within the soul. How much of my materiality has taken in the pain around me? And I take myself within the arms that have taken in so many, so much. For this, for all of this. how inseparable my materiality is with whoever “me” is. There isn’t much to be done. I’m already taking what medications would be prescribed. They replace hip joints, but not lower backs. Exercise as I can tolerate. (Check.) It would be great to lose weight, but with taking insulin for diabetes, even with a perfect diet it’s difficult to not gain weight, much less lose it. Glucosamine makes my blood sugar higher, which if I started it again would mean more insulin, which might lead to further weight gain. I felt I was left with “I’m sorry, you’re all wore out, go home and live with it.” I’ve been bummed out. Feeling damned if I do, damned if I don’t. Feeling like how I feel today might be the best I feel for the rest of my life. And I’m not feeling so hot today. 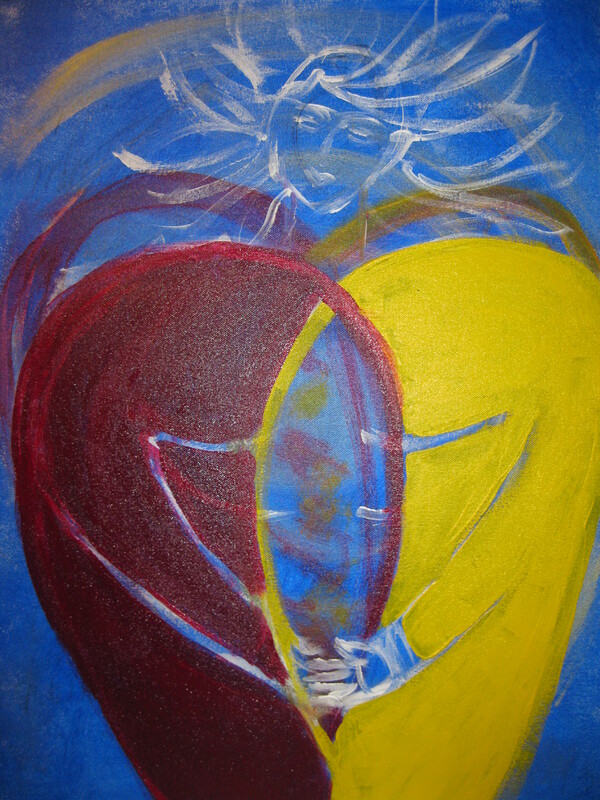 My practice is to set an intention for a painting before I do anything else with the canvas. This time, the alchemical marriage is to be about uniting my care of mind/spirit with care of body. 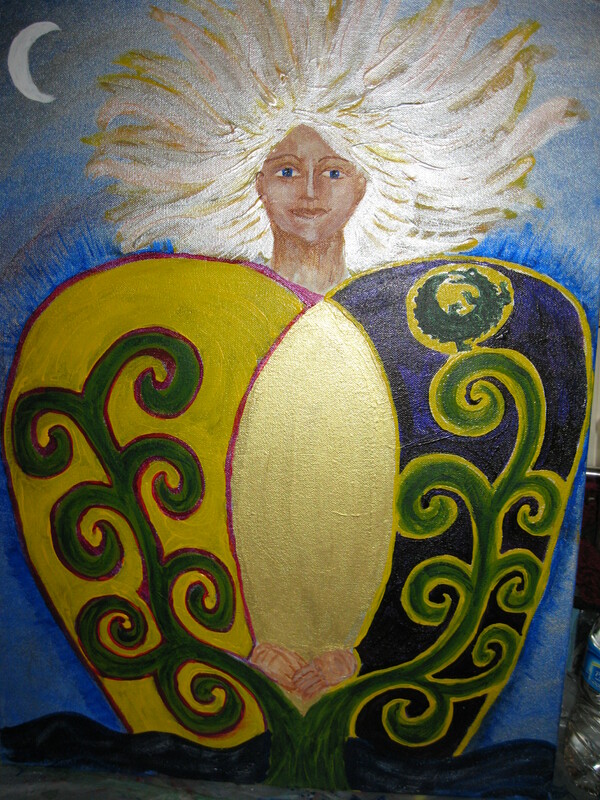 Above is my work in progress: a mandorla of gold interlocking two unusually shaped parts of me. It’s not finished yet, but I wanted to highlight a work in progress. It was after I started painting that I got the good news/bad news. The night I began the painting, I had a dream about my health that featured an old listless alligator, but that is a subject for the next post. What an interesting juxtaposition of intention and events. Not exactly sure what that means I’m supposed to do next, but I do see that something is going on that can be quite meaningful for me.